A former Cowichan Valley dairy farm has become a place of healing over the past 18 months, as a result of a ministry initiative of Mustard Seed Church in Victoria. 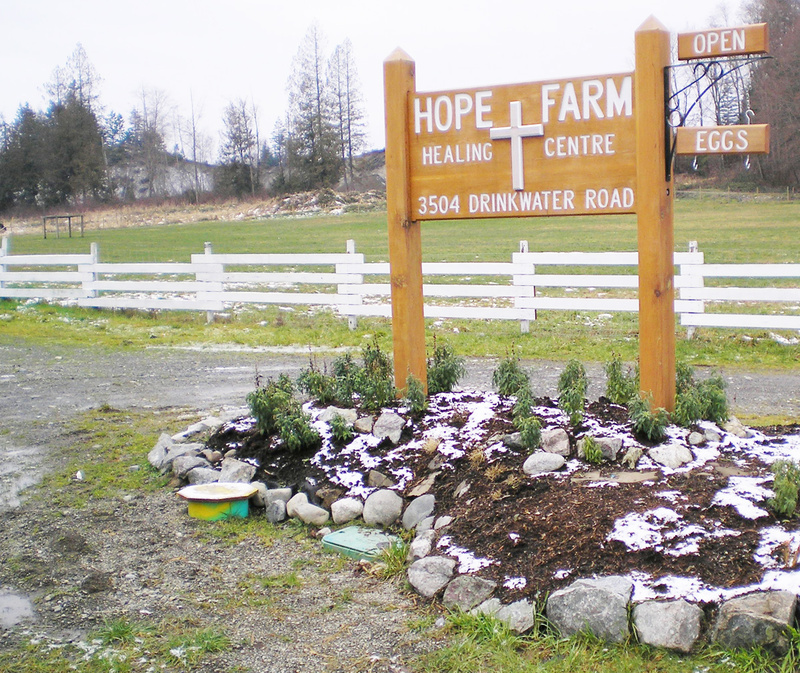 Chris Riddell, the pastor (and executive director) of Hope Farm Healing Centre, told BC Christian News recently that “four streams of healing, intellectual, emotional, spiritual and physical” are in play at the centre. Until a couple of years ago, most of the 36 acre property was a dairy operation owned by Gary Sangha. The Mustard Seed purchased the 36-acre farm for $685,000. The acquisition of an adjoining four-acre site brought the total acquisition price to $1.2 million. Not too bad a price, opines Riddell, a former long time provincial government engineer who took pastoral studies at Carey Theological College at UBC after his retirement from that work. He saw the Hope Farm need emerging first hand, as a Seed volunteer since 1989, when he was still earning a living at engineering. The annual operational costs run to about $340,000, all raised through private donations, with no government subsidies. As the centre develops, with its organic mixed-farming approach, some revenue comes from the sale of fruits, vegetables, eggs and meat produced on site. Riddell’s optimism about the “investment” for a centre primarily focused on assisting “people with drug and alcohol addictions” is based on Mustard Seed’s awareness and experience. Over the years, the director notes, church leaders have seen that “the same people, and now, often, their children and grandchildren, find themselves in the addiction cycle. Every addicted person affects 12 to 15 people. “We felt we wanted to take a broader approach” than what was available to agencies – including the Seed, as it is affectionately nicknamed – working in downtown Victoria. The use of organic methods, together with the mixed farming model, is in line with the B.C. Agricultural Land Commission recommendations for optimal land use. The client commitment is for at least a year, says Riddell, because it takes a fair amount of focused attention to help people deal with the addiction issues. Clients come to the farm through the Seed, after a thorough interview process. The daily program includes worship, prayer, physical exercise, education, household chores and farm labour. The Seed has been operating in Victoria as church and social agency for the past 25 years. It is affiliated with the Canadian Baptists of Western Canada (CBWC), a group of 178 churches serving a worshipping community of about 100,000 in the four western provinces. The Victoria Seed is one of two in the group, the other being located in Calgary. Tom Oshiro, a vigorous 80 year old with long pastoral and denominational experience in the CBWC, is the Seed’s director. He has seen both the need and vision for Hope Farm develop in recent years. The farm has a staff of six, in addition to Riddell as pastor/director. The others are drug and alcohol counsellor Pierre Leroux, the house manager; pastoral care and counselling – and horticultural – specialist, Michael Burdge; Bob Wessell, the farmer; the night care givers, Syd Goodale and Tim Sparrow; and the cook, Samantha Mullen. In addition to the staff, a significant number of volunteers are involved. People from nearby New Hope Community Baptist Church, a large CBWC congregation, for example, are set to offer Alpha courses this fall, as part of the spiritual healing program. Riddell lives in Saanich. He works both out of The Seed office on Queens Avenue near downtown Victoria; and at the farm, which is about an hour’s drive north of Victoria.